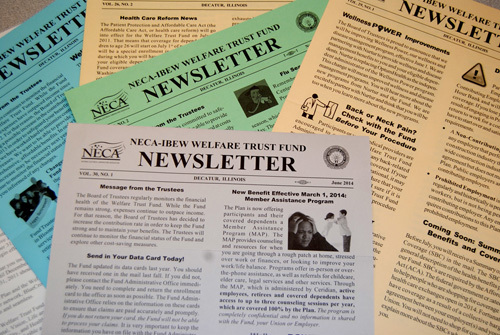 The NECA-IBEW Welfare Trust Fund (Welfare Trust Fund) was established on November 21, 1955. There were originally five locals that started the Welfare Trust Fund: Local #146, Decatur, IL; Local #193, Springfield, IL; Local #34, Peoria, IL; Local #601, Champaign, IL; and Local #538, Danville, IL. The beginning contribution was five cents per hour. There are currently 19 Locals that are administered by the Fund Office. These locals span from Milwaukee, Wisconsin to Miami, Florida. The Welfare Trust Fund, commonly known as the “Decatur Plan”, is administered in Decatur, Illinois. The Welfare Trust Fund was, at its inception, an insured plan with Aetna Insurance Company. In October of 1967, the Welfare Trust Fund became self-insured and in April of 1991, the Welfare Trust Fund became self-administered. A Preferred Provider Organization (PPO) is a group of physicians and hospitals that have negotiated a contract with the Welfare Trust Fund to provide discounts to members. Physicians and hospitals that participate in the PPO Network are known as PPO Providers. BlueCross BlueShield, the Plan’s current PPO Network, will answer your questions regarding whether your provider participates in their network. The Welfare Trust Fund has entered into an agreement with a Preferred Provider Dental Organization (PPDO). You and your dependents may choose dental treatment provided by network providers or non-network providers. Network providers have negotiated an agreement with the PPDO to discount prices. By using a PPDO provider, you will gain more services for your dental maximum. For more information, visit the Guardian Dental website. Prescription Drug Benefits are available to all employees and their eligible dependents. The Plan’s Prescription Drug Benefits are provided through CVS/Caremark or SilverScript for retirees and their spouses and dependents who are Medicare-eligible. Vision benefits are covered by the Welfare Trust Fund. Please refer to the Summary Plan Description 2013 for more information. The Welfare Trust Fund, in partnership with EPIC Hearing Service Plan, assists active participants and pre-Medicare retirees* in locating hearing care professionals and, in most cases, reducing out-of-pocket expenses for hearing exams and hearing aid devices. For more information, please see the Epic Hearing Service Plan informational brochure or the Summary Plan Description 2013. A current Data Claim Statement (Data Card) is required to avoid any delays in processing your claims. For your convenience, the Interactive Data Card can be completed online. You can then print and return the completed Data Card to NECA-IBEW by fax or postal mail. Please do not email the Data Card as it contains private information and email may not be HIPAA-compliant. The Welfare Trust Fund’s Summary Plan Description 2013 (SPD) contains highlights of certain features of the Welfare Trust Fund Base Plan for Active Employees (the Plan) and their dependents. Full details are contained in the Plan Documents, Trust Agreements, insurance contracts, and the collective bargaining agreements that establish the Plan provisions. If there is a discrepancy between the wording in the SPD and the Plan Documents that establish the Plan, the Plan Document language shall govern. The SPD is printed every five years. 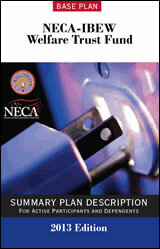 This Summary Plan Description 2013 booklet replaces and supersedes any previous SPD. If the Plan is amended or modified, you will receive written notice of such changes. These Plan change notifications can be found in the Documents and Forms Library, in the Newsletters category.